The Divisional round of the NFL playoffs lived up to its reputation as the ‘best week in the entire NFL season,’ culminating in one of the craziest finishes in NFL history in Minneapolis. Two underdogs were able to move on by winning one-score games against teams that spent much of the season near the top of our PFFELO rating system, while the Patriots (as we predicted) overcame all of the manufactured noise to cover in rocking-chair fashion against an overmatched Titans team. Alas, we’re back to handicap the rest of the playoffs using our PFFELO system, as well as some of the other metrics that go into our weekly spread and over/under picks. We’ve simulated the playoffs a few thousand times to determine the probability each team advances to each remaining round, as well as the probability each team wins the Super Bowl. These have been updated each week to reflect the results from each week, culminating in our eventual pick during Super Bowl week. Note: We do not give Minnesota home-field advantage should they make the Super Bowl. We simply do not have the historical data to determine how much (if any) to give to them, and hence err on the side of caution here. 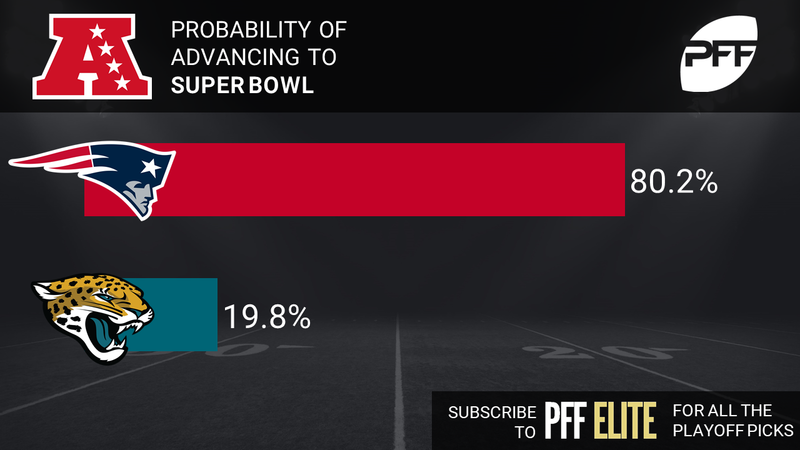 With what was likely their toughest competition in the AFC going down on Sunday, the Patriots’ odds of making the Super Bowl again increased without having to do much of anything on their end. We’ll get to see the best offense in our metrics face the second-best defense in the AFC title game, with the league’s best quarterback (and his 95.0 PFF grade) facing off against a back seven with no players graded below a 79.8 in our system. Ultimately, if Blake Bortles (79.0) cannot be efficient with his arm and legs against a New England defense that surrendered no more than 17 points yet again last week, it will be very difficult for Leonard Fournette (74.7) and the Jaguars’ running game to put up enough points to make them a viable threat Sunday afternoon in Foxboro.